The NRA Is Killing Our Kids? Is this a legitimate position to argue from? Not one mass shooter has been a member of the NRA. The NRA has trained more people in firearm safety and responsibility than any other organization. Not only is shouting and disparaging someone not a great way to persuade them, it often times has the exact opposite effect. Galvanizing them in their opinion and reaffirming that they are rational and anyone arguing differently is not. For this reason, I have ALWAYS advocated in every instance that it is only productive to have a dialog that is respectful and that educated arguments are the only way to effectively convey a message. So again, as in my piece where I strip out politics and focus solely on strategies that will help make schools safer, I am going to keep politics out of this. I want to focus simply on what really is killing the youth in America. Many voices in the media, as well as activists, are telling us that guns and the NRA are killing children in America. No doubt that evil people have used guns to take the lives of innocent kids across the country. Haphazardly redefining constitutional rights, civil liberties and maligning 5 million Americans as ‘killers of children' may seem like a small price to pay to protect children. But will these strategies really have the impact we want, if we are honestly looking at protecting children? The answer only comes when you understand the big picture and put into context the effect of the proposals and the actual causes of death to our children. In order to reach a goal, all participants must work toward the same thing. Let's begin by agreeing that all human life is valuable. Any death is tragic and we should always do what we can to protect lives, no matter their status, age, ethnicity, the location of death or any other arbitrary metric. Stating the goal is only the start, we have to identify where the problem lies and formulate a plan to address it. If people truly believe that those that do not agree with them want to kill children, there can be no productive debate. How Many People Are Dying? According to the Center For Disease Control (CDC), in the year 2014, (the most recent year all statistics were available) all injury deaths in the United States totaled 199,752. For perspective that relates to 62.6 injury-related deaths per 100,000. Guns accounted for 33,594, or 16.8% of all injury deaths. The figure of 33,594 includes accidental shootings, suicides, and unjustified homicides (those that were not deemed justified because of a civilian or law enforcement claim of self-defense). By combining the data from the CDC and the FBI Uniformed Crime Report we can break down the numbers even more. In 2014 there were 11,961 homicides, 21,386suicides and 247 accidental deaths involving a firearm. For perspective, guns were used in 6% of all injury-related deaths and used in 36% of homicides. Guns were used more likely to be used to commit suicide than homicide, as they accounted for almost 50% of the suicides. Would you be surprised to know that in 2014 11,407 people committed suicide by suffocation? This means almost the same number of people committed suicide by suffocation than were murdered by a person using a firearm! Even so, I don't think we should restrict the purchase of MyPillows. The methods of suicide in 2014. 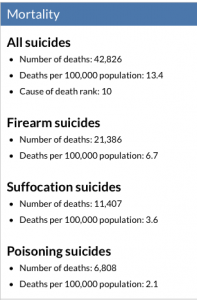 Guns are used in about half of all suicides. But suffocation is surprisingly high. How Does This Relate to Children? Lets again state that any life should be protected. The 199,752 people who lost their lives in 2014 due to injury is unfortunate. While media and pendants spend countless hours talking about the plight of guns in America, 6% of these deaths were attributed to firearms. The thing you are not hearing is how 32,744 people lost their lives in 2014 in traffic collisions. This is roughly 11,000 more deaths than all the homicides in the same year. Of these 32,744 people killed, 2,630 were of ages 13-19. In other words, if you took all the murders in 2014 where a rifle was used, you would have to multiply it ten times, to reach the number of 13-19-year-olds that were killed in automobile accidents. It matters when we look at proposals like raising the legal age to buy a rifle from 18 to 21, in hopes that it will make an impact on reducing murder in general and especially make our children safer. We would do far more to protect children's' lives by raising the age to have an unrestricted driver's license to 21. Traffic collisions take far more children from us than guns. Why no outrage? The Insurance Institute for Highway Safety Highway Loss Data Institute (IIHSHLDI) showed that ‘crash death rate per population has fallen by nearly half since the 1970s, but increased 5 percent from 2015 to 2016.' This is not a great trend, and yet, no focus on what caused the uptick, and outrage to fix it. The IIHSHLDI shows that crash rate for 16-19-year-olds is 3 times greater than that of drivers 20 years or older. We are losing a disproportionately high number of children in vehicle accidents yet, in many states 14-year-olds can get learner permit licenses. In the US, the average age to obtain a restricted license is 16 and a full non-restricted license 17. Yet states are rushing to raise the legal age buy a rifle instead of to drive an automobile? Why would they choose this course if the facts make it clear that raising the driving age would go much further in saving lives? Perhaps it is because as a society we consider 18 the age at which adulthood begins. 18-year-olds do not need parental permission to join the military and risk their lives fighting on foreign lands. They can vote, live on their own, get a credit card, drive a car, make their own medical decisions, and be tried as an adult and if in custody, transferred to an adult prison. Across the country, hunting and protecting livestock on the family farm is a way of life. Responsibility is learned in part with the use of a rifle. But now, purchasing a rifle or shotgun is beyond their ability? The veteran returning from war, who handled firearms in the defense of our freedoms, cannot come back home and purchase a hunting rifle. Can't go out into the farmland and kill varmints that destroy their family crops and farm animals. In fact, has he/she become a criminal if upon return they do not relinquish the rifles currently owned? People can disagree on where adulthood begins, and what responsibilities should come along with it. People can disagree on the merits of owning an AR-15. There can be opposing points of view on if anyone should even own a firearm at all. But what can't be disputed are the raw numbers of what really is the biggest threat to our children. It is not guns, its vehicle accidents. I am not advocating for raising the driving age, I am merely pointing out that if we are truly honest in wanting to do whatever we can to save lives, we should focus on the biggest cause, not the most sensationalized. Elevating guns as the problem above all else comes across as uninformed, dubious and disingenuous, especially when the intended policies are proven to be ineffective when implemented. 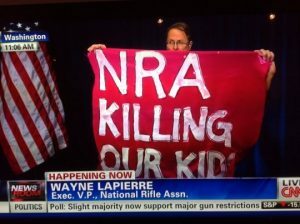 10 Responses to The NRA Is Killing Our Kids? If people would look at the situations these kids are inand they don’t know how to handle it. It’s not grown ups that are killing kids. It’s kids. So, wevneed to raisebthebage to get a driver lucense to 21 and let theb18 year old buy a gun? Never type when you’ve been up 18 hours. Doctors kill more people with their prescription drugs, not counting opiods. There are other statistics that are also important. The number of people killed (intentionally) by a knife each year is roughly 3 times greater than the number of people killed by rifles (including assault rifles). Also, out of roughly 350 million guns (estimated) in the USA, less than 10 are used in any given year for school-shootings. Okay, double that number used but it is still such a ridiculously small fraction that the idea of spending time and energy on legislation to affect fewer than 20 guns annually would seem to be absurd. The same is true of the number of people who have chosen to shoot innocent children or anybody, for that matter. Fewer than 100 people have been school shooters in the past 50 years. The size of magazines, whether a firearm is termed an “assault” rifle or a “sniper rifle’ or merely a “gun” is immaterial. And saying the NRA is responsible for shooting deaths is like saying the AAA is responsible for drunk drivers. Government INCOMPETENCE is killing out ‘kids’; the NRA has nothing to do with it. The NRA is an EFFECTIVE Grassroots CIVIL RIGHTS organization. The LEFT hates them for their effectiveness, and ‘roadblock’ to ‘progressivism’; the ‘Progressive Income Tax’ has been a BIG, if not THE BIGGEST success they’ve had. The ‘primary source’ of Federal money was the ‘Whiskey Tax’; with prohibition, that money went away and had to be replaced; hence the ‘small’ income tax amendment to the Constitution. Efforts to rid the country of ‘demon Rum’ resulted in the tax code mess we have today….way to go PEOPLE. the left is trying to replicate this feat with abolishing by law, the Second Amendment. First step is to define what the problem is. I liked Albert’s assessment of the situation of the incompetence of our government to screw up the tax system trying to fix a different screw up. The money was there for the taking, why make it illegal and keep robbing us?! Leave a Reply to Rob Beckman Click here to cancel reply.